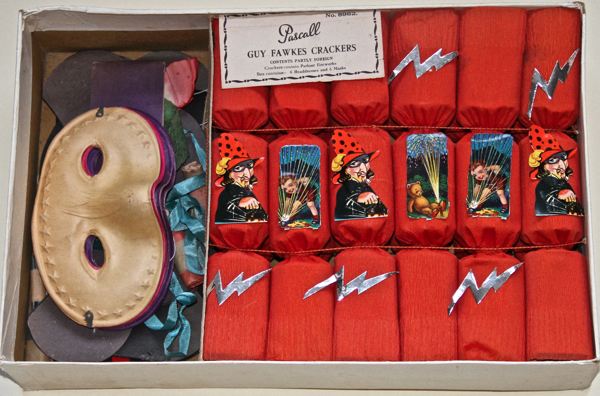 I am republishing my pen portrait of Maurice Evans today to celebrate the opening of the exhibition of his collection of fireworks entitled Remember, Remember presented by the Museum of British Folklore at Compton Verney. 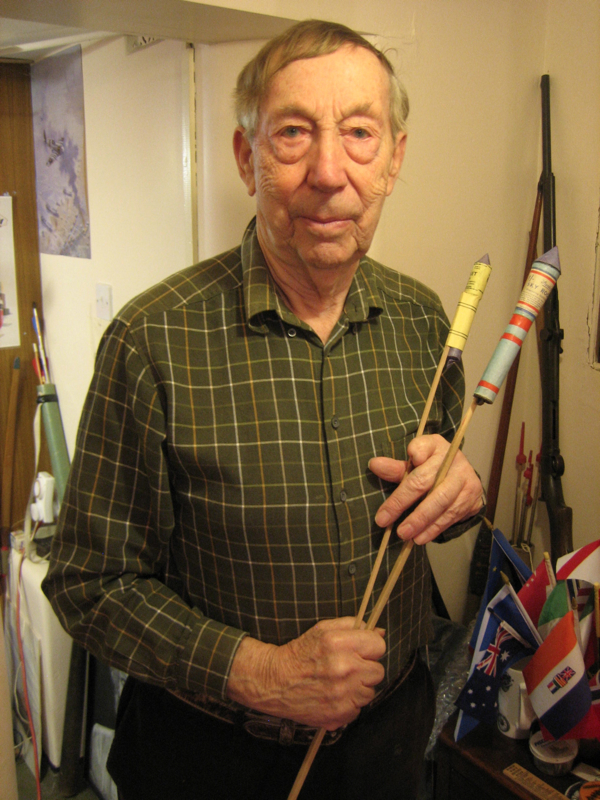 Maurice Evans has been collecting fireworks since childhood and now at eighty-two years old he has the most comprehensive collection in the country – so you can imagine both my excitement and my trepidation upon stepping through the threshold of his house in Steyning. 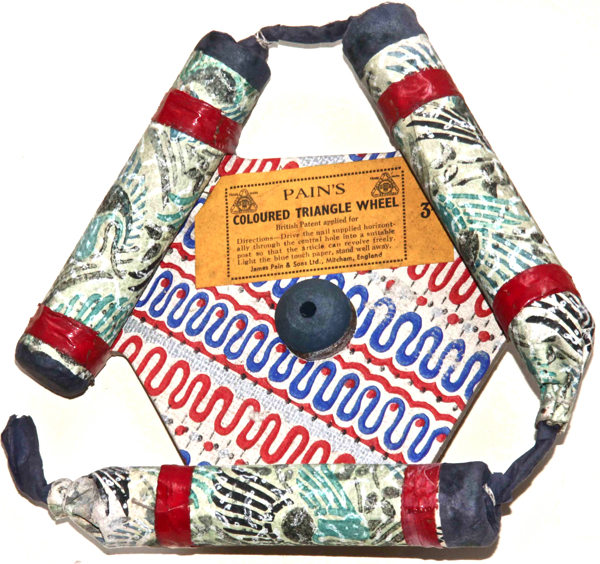 My concern about potential explosion was relieved when Maurice confirmed that he has removed the gunpowder from his fireworks, only to be reawakened when his wife Kit helpfully revealed that Catherine Wheels and Bangers were excepted because you cannot extract the gunpowder without ruining them. 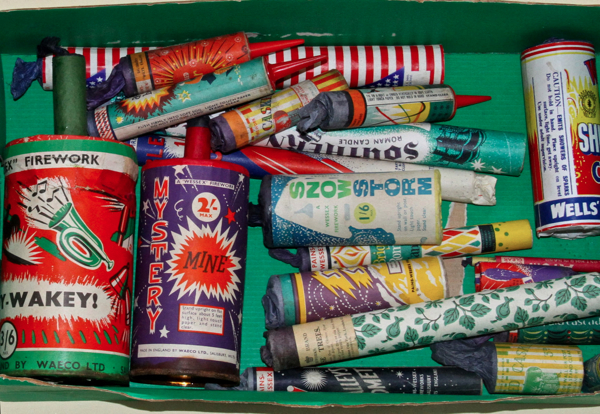 This statement prompted Maurice to remember with visible pleasure that he still had a collection of World War II shells in the cellar and, of course, the reinforced steel shed in the garden full of live fireworks. “Let’s just say, if there’s a big bang in the neighbourhood, the police always come here first to see if it’s me,” admitted Maurice with a playful smirk. “Which it often isn’t,” added Kit, backing Maurice up with a complicit demonstration of knowing innocence. 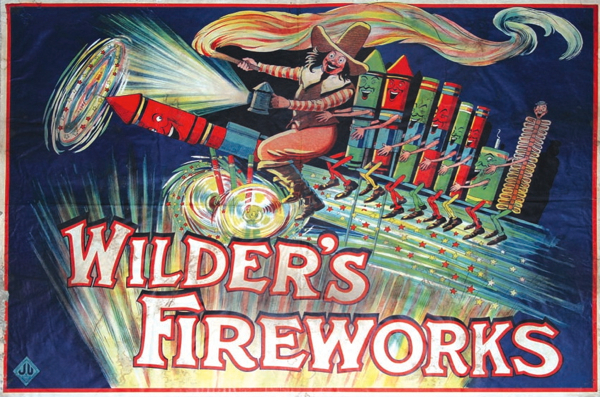 After the war, Maurice teamed up with a pyrotechnician from London and they travelled the country giving displays which Maurice devised, achieving delights that transcended his childhood hunger for explosions. “In my mind, I could envisage the sequence of fireworks and colours, and that was what I used to enjoy. You’ve got all the colours to start with, smoke, smoke colours, ground explosions, aerial explosions – it’s endless the amount of different things you can do. The art of it is knowing how to choose.” explained Maurice, his face illuminated by the images flickering in his mind. 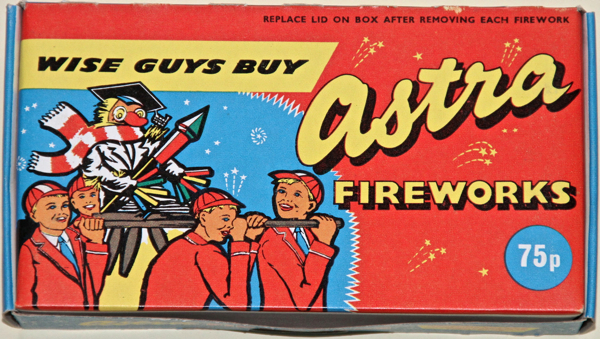 Adding, “I used to be quite big in fireworks at one time.” with calculated understatement. Yet all this personal history was the mere pre-amble before Maurice led me through his house, immaculately clean, lined with patterned carpets and papers and witty curios of every description. Then in the kitchen, overlooking the garden where old trees stood among snowdrops, he opened an unexpected cupboard door to reveal a narrow red staircase going down. We descended to enter the burrow where Maurice has his rifle range, his collections, model aeroplanes, bombs and fireworks – all sharing the properties of flight and explosiveness. 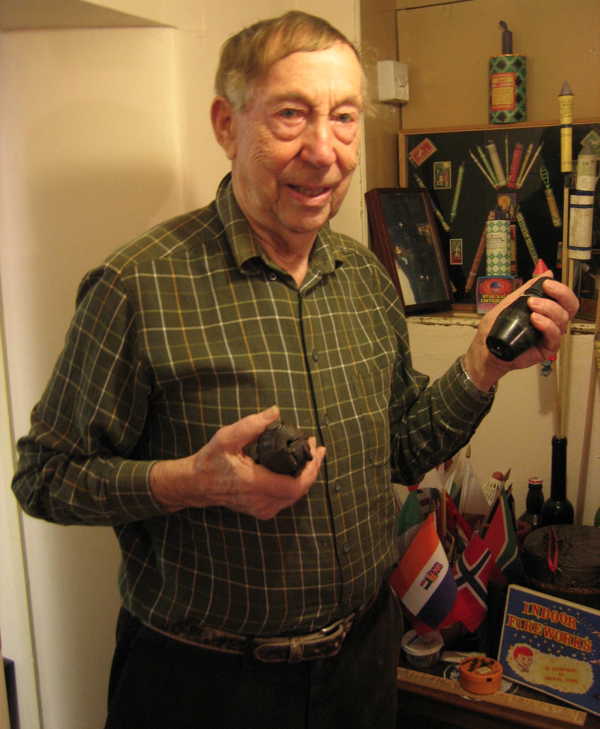 Once they were within reach, Maurice could not restrain his delight in picking up the shells and mortars of his childhood, explaining their explosive qualities and functions. But my eyes were drawn by all the fireworks that lined the walls and glass cases, and the deep blues, lemon yellows and scarlets of their wrappers and casings. 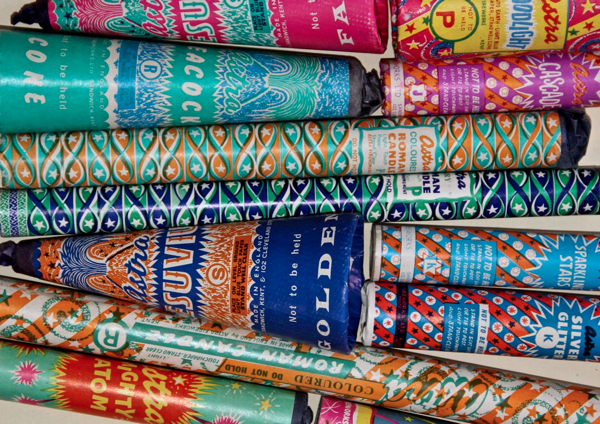 Such evocative colours and intricate designs which in their distinctive style of type and motif, draw upon the excitement and anticipation of magic we all share as children, feelings that compose into a lifelong love of fireworks. 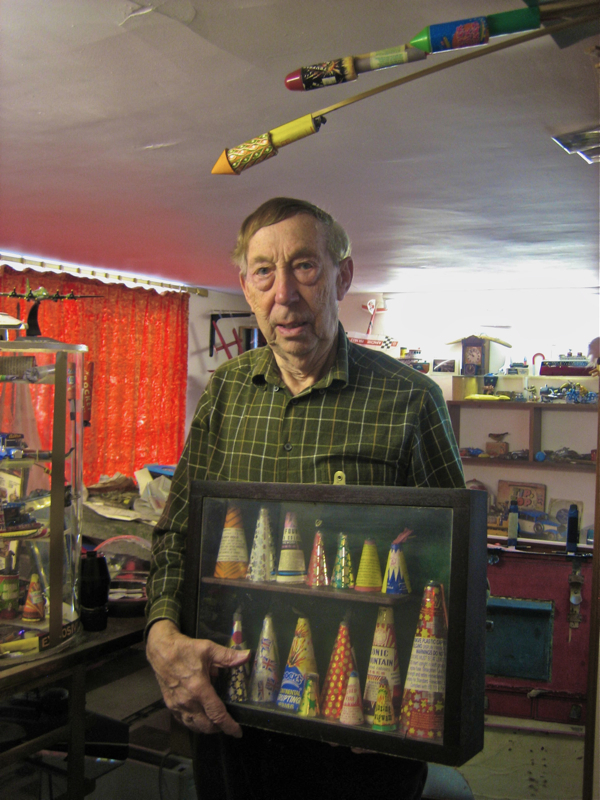 Rockets, Roman Candles, Catherine Wheels, Bangers, and Sparklers – amounting to thousands in boxes and crates, Maurice’s extraordinary collection is the history of fireworks in this country. “I wouldn’t say its made my life, but its certainly livened it up,” confided Maurice, seeing my wonder at his overwhelming display. 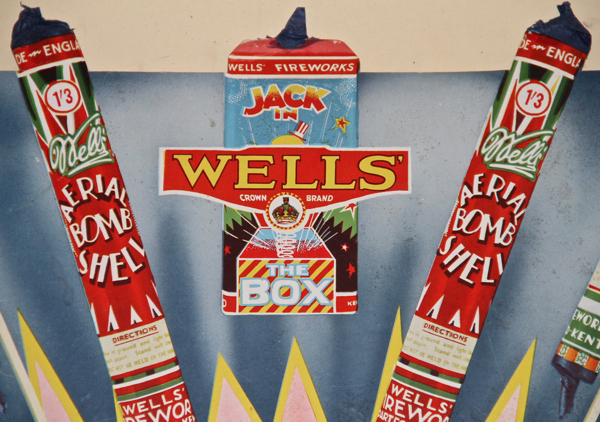 Because no-one (except Maurice) keeps fireworks, there is something extraordinary in seeing so many old ones and it sets your imagination racing to envisage the potential spectacle that these small cardboard parcels propose. “My father used to bring me the used ones to keep,” confessed Maurice quietly with an affectionate gleam in his eye, as he revealed the emotional origin of his collection, now that we were alone together in the cellar. With touching selflessness, having derived so much joy from collecting his fireworks, Maurice wants to share them with everybody else. 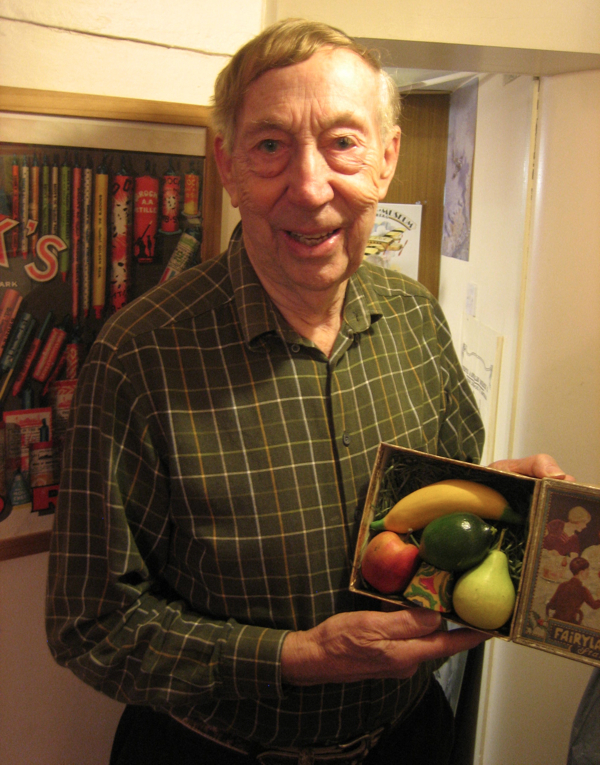 Maurice with his exploding fruit. 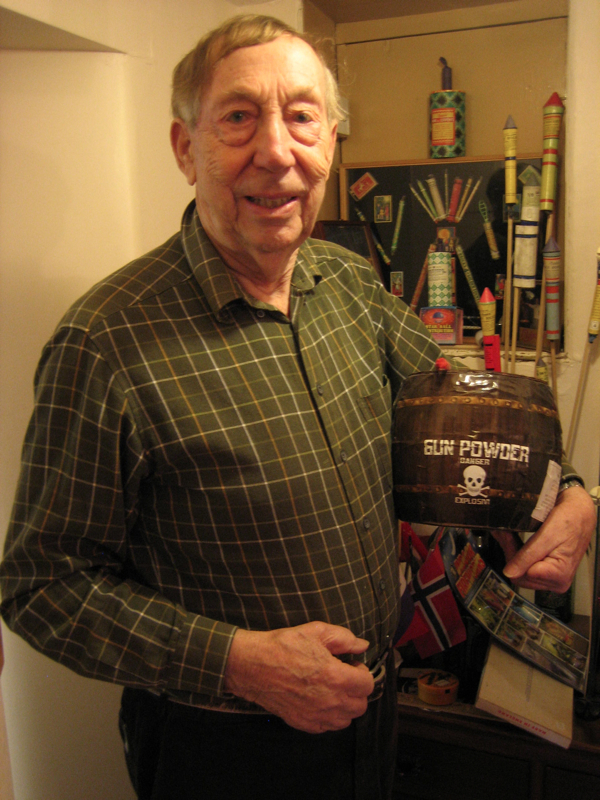 Maurice with his barrel of gunpowder. Maurice with a couple of favourite rockets. 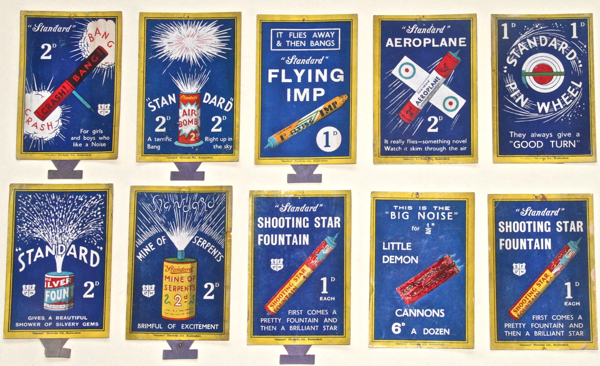 The Museum of British Folklore’s exhibition Remember, Remember featuring Maurice Evans’ firework collection runs at Compton Verney until 11th December. Ahh, Standard, Pains, Lion, Astra.. wonderful stuff! How it takes me back! 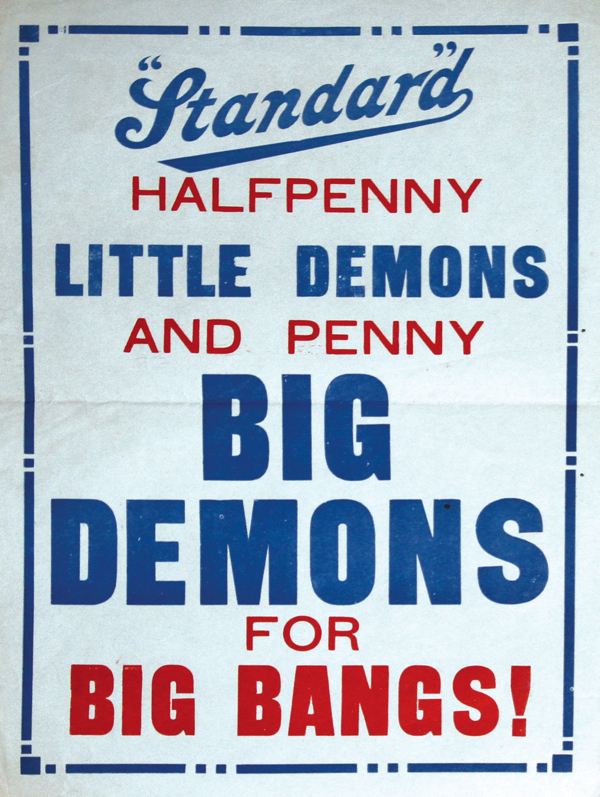 Something that seems to have completely disappeared, in these days of regulated displays and Elf Ann Safety.. 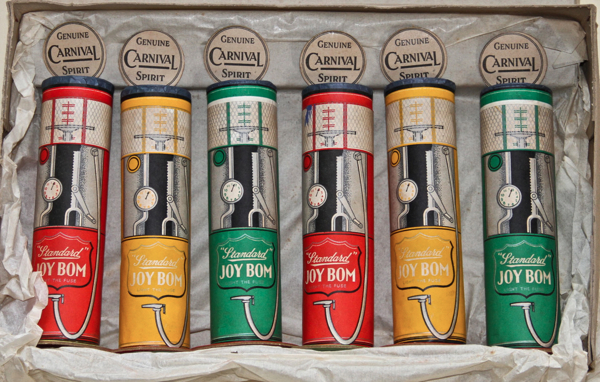 I used to fill a cigar drum each year with 1d 1 1/2d and 2d bangers, for use on the day. 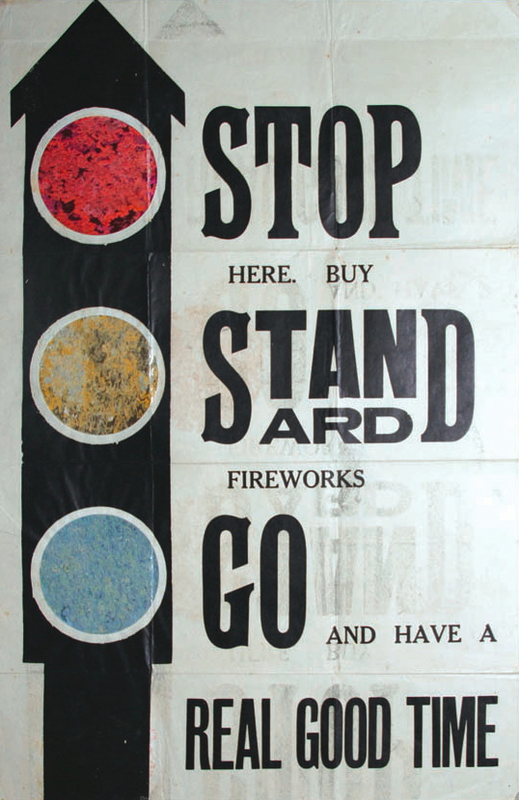 I hope someone in America has been as avid a collector as Maurice so that someday I might see an exhibition that captures the wonders of my childhood 4th of July celebrations. His collection is fantastic! Wonderful! 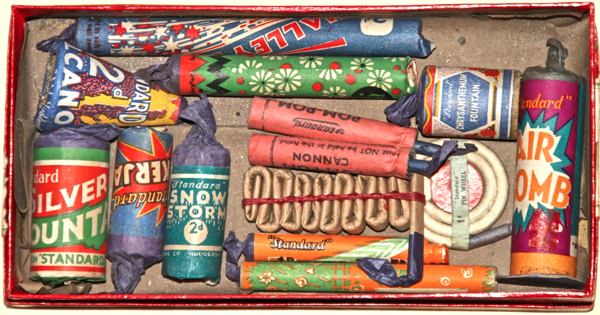 Takes me back to a fifties northern childhood;we would save our pocket money and buy one firework a week to be stored in a biscuit tin till bonfire night. Had to have homemade treacle toffee as well! 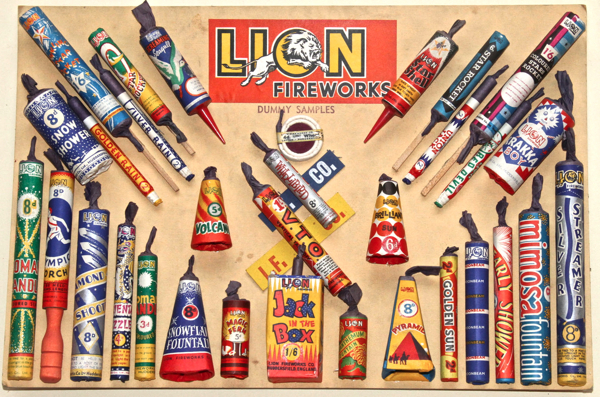 I’m the great grandson of Harry Kilner who formed Lion Fireworks. 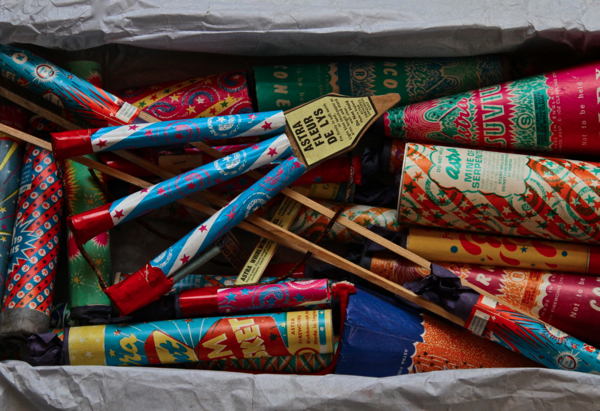 I used to pack fireworks as a teenager at Lion factory. I have no photo’s of the factory unfortunately but am looking at writng history of my family during period of Lion’s history. Do you have any photo’s of the factory ? Photo of the factory gate would be great. I used to help closing them on saturday with my dad…!